Why live in East Vancouver? The East Vancouver Real Estate Market is booming! The area is known as “East Van” or the “East Side” of Vancouver BC. It is bordered to the north by Burrard Inlet. To the south by the Fraser River, and the east by the city of Burnaby and to the west by Main Street. East Vancouver was affordable for many lower-income working class. Family income, ethnicity and mother tongue summarize its diversity. The rapid increase in housing prices may be affecting the type of residents moving in. Immigrant waves have passed through East Vancouver. Including English, Welsh, Irish, Scottish, Italians, German, Eastern European, Chinese, South East Asian, South Asian. Each neigbourhood has its ethnic identity. This distinct identity has many healthy, active ethnic communities. There is a vibrant artistic presence and a politically engaged youth population. As well as a vocal sexual-orientation and gender-identity groups. The SkyTrain is the oldest and longest fully automated driverless rapid transit system in the world. The SkyTrain rapid transit system (current Expo Line) was built in 1985 for Expo 86 and to connect downtown Vancouver to Surrey with five SkyTrain stations in East Vancouver. The most prized real estate in East Vancouver is near the Skytrain Stations. New Condo Developments and townhouses are rapidly increasing. In 2007, the typical housing price of a single-detached house in East Vancouver was $627,758 (a 9% increase over the previous year and a 90% increase over the previous five years). 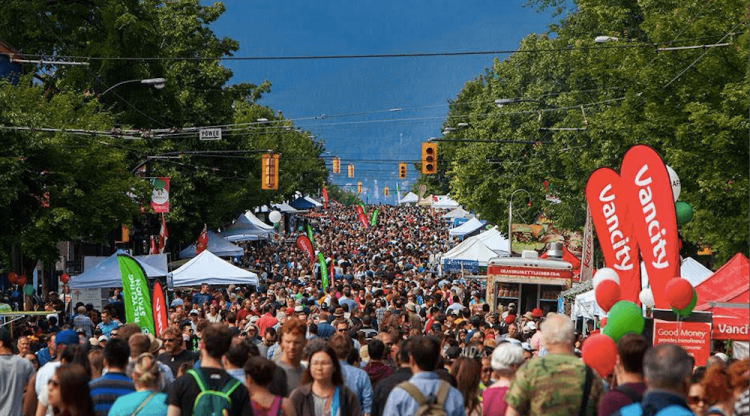 Increased housing prices have caused significant positive changes in East Vancouver, such as keeping existing residents, increased affordable housing options like condos, laneway houses, and townhomes. More residential investment, more community-pride events like neighbourhood clean-ups, block parties, and community gardening. Resulting in a greater tax base for new amenities such as Libraries and street lighting. There are many pockets of New business ventures catering to the new gentries moving into the area. The East Van neighbourhoods are becoming well known for their Craft Beer breweries on Commercial drive, Adanac and Clarke drive. Trout Lake the only lake in the city, with one end dedicated to humans and the other end for dogs to swim in. The multi-use Memorial Park, which is dedicated to soldiers who died in WW1 and today provides many spaces for sports teams and neighbours alike. Another park is the Falaise Park on the border of Burnaby and Vancouver. Riley Park, Strathcona, and Victoria-Fraserview. But we’ve got many more; check out our East Vancouver Neighbourhoods page for our full listing.